In the current electronic age, many people think of paper as a dying industry. While it’s true that more businesses are going “paperless,” consider all the paper products that are still used in homes and offices every day. These would include things such as paper towels, hygiene products, diapers, etc. All of these items are made in paper factories that were either built for these products or have been retooled to manufacture them. In addition, these segments of industry are growing, causing the demand to keep the machines running at an all-time high. One of the best ways to achieve fault-free operation of paper machines is to ensure the proper lubricant is applied to the frictional surfaces. Most paper machines have hundreds, if not thousands, of lube points that require periodic application of oil or grease. There are bearings, gears, couplings, journals, cylinders and valves which must all receive the correct lubricant to survive the rigors of the paper-making process. Since paper machines often have a high number of lube points in close proximity, they typically are lubricated with circulating oil. In this setup, oil is pumped from a central reservoir throughout the system, with supply piping running to the lube points and return piping channeling lubricant back to the reservoir. This type of lubrication system is advantageous for a variety of reasons. Machines lubricated with circulating oil tend to operate cooler than those that are splash-lubricated. This reduced operating temperature helps extend the life of the lubricant and the lubricated component. Besides its cooling function, circulating oil also can reduce the labor costs of lubricating each point individually. Although a lubrication technician must monitor each line to ensure the proper volume is being applied, physically adding oil to every point is not required with these systems. Circulating systems employ pumps that force oil where it needs to go. Since the oil is pumped, there is an opportunity to filter it and remove harmful contaminants that may damage sensitive machine components. It is not uncommon to find multiple filter locations within paper machine oil systems. Filters located in the supply line can remove contaminants before the oil goes to work. Filters in the return line help scrub contaminants that were recently ingressed by the process. Off-line filters continually circulate oil in the reservoir through filters to further polish the oil. When all of these filters are utilized in unison, not only will the circulating oil be very clean, but vast amounts of machine wear can be reduced. Paper machine circulating systems normally hold hundreds if not thousands of gallons of oil. With this volume, the oil has adequate residence time in the reservoir, allowing particles and water to fall out of suspension, air to separate, and the oil to cool. There is also a larger volume of additives to enhance the oil’s lubricating properties. All of these factors can combine to significantly extend the life of the oil and equipment. Along with serving multiple functions inside the circulating system, paper machine lubricants must lubricate numerous component types. Bearings are perhaps the most common, particularly roll bearings tied to the centralized lubrication system. These rolls help transport, size and dry the paper. As the rolls turn, the bearings must be simultaneously lubricated and cooled. The flowing oil transfers heat away from the bearing and provides the required lubricating film for smooth, consistent operation. If the bearing housing allows contaminants into the system, the moving oil can carry these contaminants out of the housing to the filters or reservoir to be settled out of the system. In some paper machines, the centralized lubrication system also lubricates gearing that drives certain sections of the machine. Gears present a different challenge than bearings in that the load tends to be much higher. This leads to greater stress on the lubricant film and generally requires the use of additives to protect the machine surfaces. The gears are commonly simple spur gears that mesh together. They can handle more chemically active lubricants without the risk of corrosion or chemical degradation to the gear surface. These gears often have a more defined pitch line, which makes the building of a lubricating film easier. During the paper manufacturing process, wet pulp is placed onto a web or screen and then transported through the machine where it is dried and fashioned into the desired thickness. The press and calender sections are where the finished product’s thickness is usually formed. In these sections, the paper machine lubricant may also be used as a hydraulic medium. The oil provides the force required to push the rolls together, determining the paper’s thickness. The hydraulic pumps and valves in these areas of the machine are highly contaminant sensitive, so the oil must be kept relatively clean throughout its operating life to ensure the life of the components. With hundreds of pipe connections, lube points and machine interfaces, paper machines frequently are plagued by lubricant leaks. This leakage also leads to two other problems: capturing the leaked lubricant and continuously topping up the oil reservoir. Capturing the lubricant normally is achieved with pans or rails, which collect and funnel the used oil to a collection container. Some facilities have attempted to reclaim and recondition this leaked oil in order to reintroduce it into the machine. Provided the base oil and additives are still healthy, this can be a viable option, but it does have inherent risks. If the oil cannot be fully filtered to remove the gross contamination, it will become yet another source of contaminant ingression for the lubrication system. Also, the practice of capturing and then reconditioning the lubricant may not be cost-effective. The amount of effort required to clean the oil to an acceptable level would far outweigh the cost of buying new oil and adding it to the reservoir. Continually topping up the lubricant can help to extend the time between oil changes. The new lubricant brings with it new additives and dilutes any damaged base oil, thus improving the lubricating properties of the oil overall. Some paper machines never undergo a full drain-and-fill of the oil reservoir because of this practice of adding new oil as the used oil leaks out. Lubricants used in paper machines are specially formulated to handle the rigors of the application. These oils tend to have high levels of additives to combat water contamination and support the loads in working zones. The lubricants generally consist of antioxidants, rust inhibitors and anti-wear additives. In certain cases, they may also have detergent additives to help prevent buildup on machine surfaces due to the breakdown of the oil. Viscosity is the most important physical property of a lubricant and must be properly selected for the application. Paper machine lubricants typically have a viscosity of more than 150 centistokes (cSt). This viscosity allows the oil to be pumped but still provides a thick enough lubricating film to protect the bearings. If the viscosity is too low, the lubricated components will suffer accelerated wear and have a shorter lifespan. Conversely, if the viscosity is too high, additional power is needed to pump the lubricant. Temperatures may also run higher due to viscous drag. Demulsibility is another critical lubricant property to consider. The oil must be able to readily separate from any water picked up during its journey through the system. The lubricant should also be able to transport this water to the reservoir or a settling tank, where it sheds the water and continues its way through the lubrication circuit. Filters should be employed on every paper machine circulating system. Without the ability to remove contaminants, the oil and machine surfaces will degrade rapidly. Many paper mills choose filters with a focus on smaller particles, such as 10 microns or less, as they often cause the greatest damage. The selected oil must also be able to pass through the filters at all expected operating temperatures. This is largely a function of the viscosity and viscosity index. Moreover, as oil flows through the filter, the additives must remain in the oil and not be stripped by the filter. Paper machine oils require many additives, so look for lubricants that are filterable and retain their additives during the process. 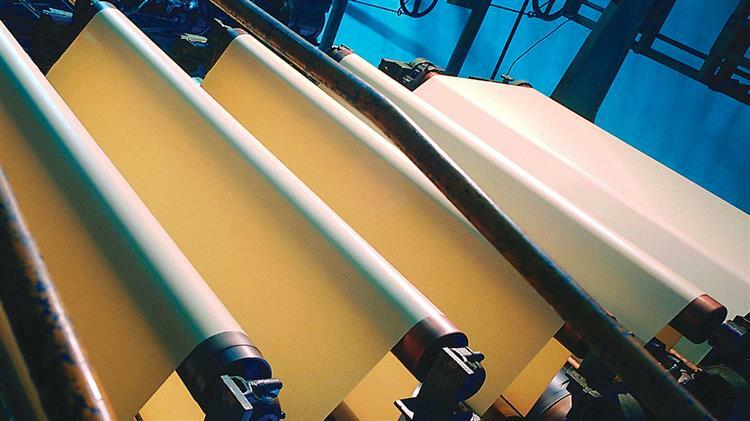 The intended use of the finished paper product can also be a factor in lubricant selection. In cases where the paper is used for food packaging or hygiene products, food-grade lubricants may be required. This will limit your lubricant options as well as the additives that can be used. Mandatory compliance with the Food Safety Modernization Act (FSMA) has made this issue even more important. Be sure to ask your internal FSMA champion what the best course of action is for minimizing any incidental contact of the lubricant with the product. Depending on the paper machine’s design, some bearings may be lubricated with grease. There are specific greases formulated for these applications as well. They typically utilize a higher viscosity base oil (above 220 cSt), have high water resistance and are white so as not to impact the color of the finished product if any grease would happen to fall onto the paper during its trip through the machine. Although certain paper machines may be greased one point at a time by a lube tech, others are tied into large, centralized greasing systems. These systems dispense grease from a central reservoir to every point using injectors. The injectors set the volume applied at each point. When automatic greasing systems are employed, the lines and each injector must be inspected to verify that they are working properly. With large volumes of oil at stake, many mills choose to change their paper machine oil based on its condition rather than taking a time-based approach. This allows them not only to get the most life out of their oil but also to track and trend variables like wear debris and contamination. Normal oil analysis test slates can be used to examine the particle count, water content, viscosity, additives and wear metals. Other tests, such as varnish potential, foam tendency and demulsibility, should also be conducted periodically to look for a breakdown of the base oil or any changes in the oil’s physical properties. Selecting the right lubricant for any application can be challenging. The same is true for paper machines. As this industry continues to evolve, the lubricants used in these machines will as well. However, by following the simple practice of keeping lubricants clean, cool and dry, you can ensure the best possible life for your lubricants and machines.